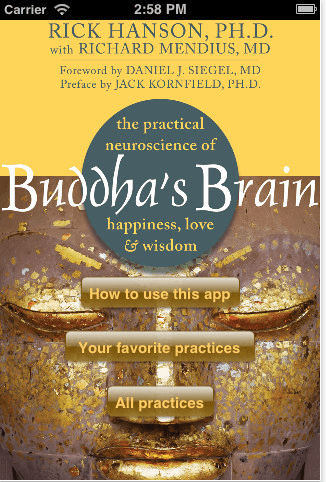 Buddha Brain takes ancient Buddhist practices and scientific data to show us how to strengthen our brain in order to have stronger relationships and an overall happier and more fulfilling life. Dr. Rick Hanson gives a lot of pragmatic tips that you can work into your daily routine in order to be happier and learn to detach from your “self.” I think the three biggest concept are: learning to respond and not react, try to be as free from preferences as possible, and “good” events are rarely as good as we build up in our heads and “bad” events nearly never as devastating. Also, Hanson’s weekly newsletter, Just One Thing, offers some straightforward and helpful insights. We are not as separate or distinct from our environment or those around us as our brain perceives it. Explicit memories are conscious recollections of specific events or experiences. Combination of compassion/empathy and assertion is vital. This entry was posted in Books and tagged Buddhism, Meditation, Rick Hanson, Spiritual on March 31, 2015 by Blas.